The small choice of choosing a respected and reputable company will make a big difference in the cleanliness of your company. For example, you can read dozens of reviews online about Jiffy storage units being pest free, but you may not find the same glowing reviews for other companies. 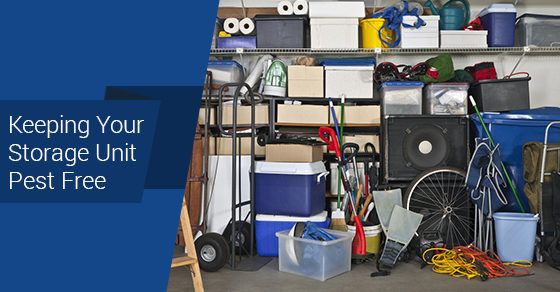 Deterring rodents begins before you even bring your items to the storage unit. Make sure to use tightly sealed plastic containers when packing your items. Rodents usually have a difficult time chewing through it and it is not a potential food source. It is always a bad idea to store food in the storage unit. Some storage companies do not permit it in their agreement and in any case, you can potentially turn your unit into a rodent magnet if there is food. If you do need to store food (and it is permissible in the agreement) then make sure that it is tightly sealed and it is non-perishable. Wrap your items in plastic, especially your furniture. Wooden items are a potential food source for rodents, and even if they don’t eat your furniture they leave harmful bodily fluids all over them. Check all your boxes and furniture for any roaches, termites or hidden insects. You don’t want to be taking them into the truck or car when you are ready to move. Also, make sure the truck is rodent-free. It might be a good idea to spray parts of the vehicle before you leave. You should have pesticides handy and ready for use when you arrive at the storage unit. Before you spray, check to make sure that the entire unit is swept clean and ready for use (as it should be). Inspect the floor, walls and ceiling for any cobweb or bugs. Then spray the entire unit before bringing in any items. Alternatively you can use peppermint oil as it is a natural deterrent to rodents. You should also place mouse traps in various parts of the unit. Inspect the traps regularly for any mice or rats that have been caught and remove the bodies promptly. You might also want to consider third party insurance. They often cover rodent damage as well as other unexpected events that can happen. If you would like to find out more about storing your items safely, Jiffy Self Storage is here! We would be happy to assist you in that process. Give us a call or come visit us for more information.